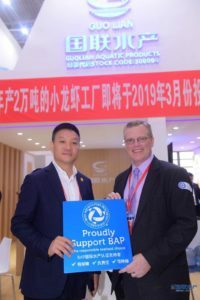 The Global Aquaculture Alliance (GAA) and its Best Aquaculture Practices (BAP) division made their presence felt at the 23rd annual China Fisheries & Seafood Expo (CFSE) at the Qingdao International Expo Center in Qingdao, China, from Nov. 7 to 9. 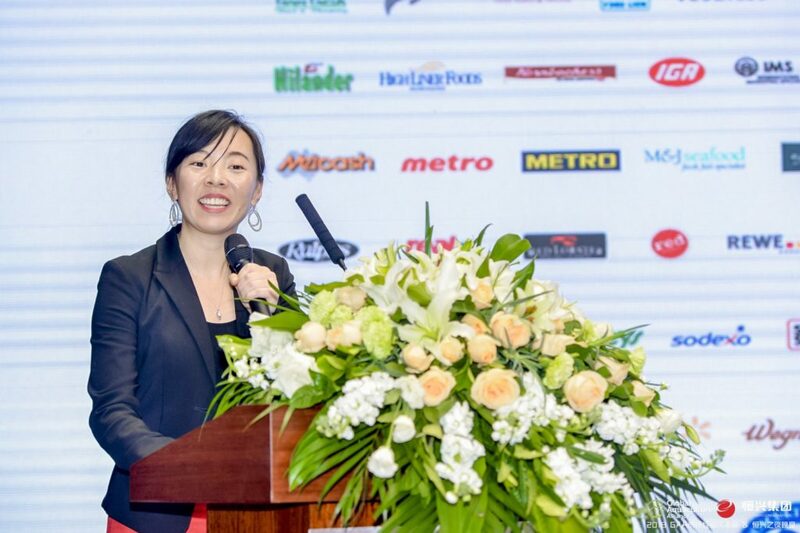 Jane Bi, BAP’s Asia Business Development Manager, presents at the China Marketplace Forum, hosted by GAA and sponsored by Guangdong Evergreen. In addition to exhibiting at CFSE 2018, which featured more than 1,500 exhibiting companies from 50-plus countries across 45,000 square meters of exhibit space, GAA hosted a China Marketplace Forum on Nov. 6. Sponsored by Guangdong Evergreen Group Co. Ltd., the forum, which drew more than 200 attendees, was an opportunity to bring together producers and buyers to discuss the major challenges and opportunities facing aquaculture, from food safety to social responsibility. GAA Executive Director Andrew Mallison and Qingdao Customs Section Chief Qin Hong gave the opening remarks. Hong focused on how China is working to make the customs process more smooth and enforcing the strictest food-safety policies, including the importance of programs like the Global Food Safety Initiative (GFSI) for improving food safety in-country and the role of BAP in helping promote food safety for seafood in China. 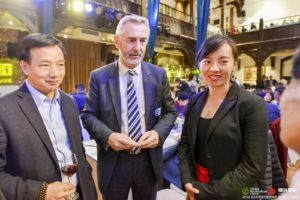 Chen Dan, chairman of Guangdong Evergreen Group Co. Ltd., with GAA Executive Director Andrew Mallison and Jane Bi, BAP’s Asia Business Development Manager. Also presenting was Chen Dan, chairman of Guangdong Evergreen, who explained the importance of international certification program like BAP in promoting domestic seafood produced in accordance with internationally recognized standards. Dan said that as Chinese consumers are becoming increasingly concerned with food safety, they will look to trusted companies that offer strict controls, especially now as China has become a net importer of seafood. He also mentioned that tilapia prices are the highest they have been in three years, as producers push product to the U.S. market before the 25 percent tariff takes effect on Jan. 1. He said he expects tilapia production to decline next year as producers shift to pangasius to meet the growing demand in China. He Guohua of Grandma’s Home, a popular high-end restaurant chain in China, said that international certification programs will become more important to assure consumers that they are getting safe and nutritious food, and that the chain plans on adopting BAP as party of its seafood sourcing policy in the future. Rachel Huang of Sam’s Club China added that the retailer has BAP in its seafood sourcing policy because of the program encompasses social responsibility. Also speaking was Tim McLellan of SINO TransPFS, who discussed the importance of engaging the cold chain supply industry to assure food safety. Following the presentations was a panel discussion on the growing importance of the Chinese market, and Lingao Haifeng Breeding Development Co. Ltd. was presented with its BAP certificate and recognized as the second golden pompano producer in China to earn BAP certification. Li Zhong, president of Zhanjiang Guolian Aquatic Products Co. Ltd., with GAA VP Steve Hart, who heads BAP’s China team. GAA participated in a number of other activities at CFSE 2018. On Nov. 6, Hart participated in the GFSI China Focus Day and discussed the importance of partnering with groups like GFSI. On Nov. 7, Hart attended an Ocean Gala Marine Resources reception where it was announced that Ocean Gala will bring one of its plants that processes primarily wild seafood into pilot testing the new Global Seafood Assurances (GSA) seafood processing standards. Also committing to pilot the new GSA seafood processing standard was Qingdao Meichu Food Co. Ltd.; the company made the announcement at its event, which Mallison attended. Andrew Mallison served as a judge for the FishTech Awards.